Whether you are a man who is experiencing unwanted, premature hair loss or you’re a women who wants to enjoy full-bodied, healthy-looking hair without the hassle and expense of using extensions, chances are good that you’ve already tried an over-the-counter hair restoration product. Perhaps you’ve spent hundreds (or even thousands) of dollars trying special shampoos, leave-in treatments and vitamin regimens; maybe you’ve even asked your doctor for prescription medication to prevent further loss of your hair. Dealing with hair loss can be expensive and emotionally draining; many people who suffer from this problem experience anxiety and a loss of self-confidence over their appearance. They may even become depressed and avoid social situations because they feel embarrassed and frustrated over their hair loss. If this sounds like you, you’re not alone: according to the American Academy of Dermatology, approximately 30 million women and 50 million men in the United States suffer from hereditary hair loss. By the time they reach the age of 50, half of all American men will experience thinning or balding hair. While genetics play an important role in the thickness and fullness of your natural hair, other factors like stress, medications, allergies, hair dyes, diet and hormonal changes can all impact the health of your hair. Because there is no universal reason why people loose their hair, finding the right solution to hair loss can be a frustrating experience. 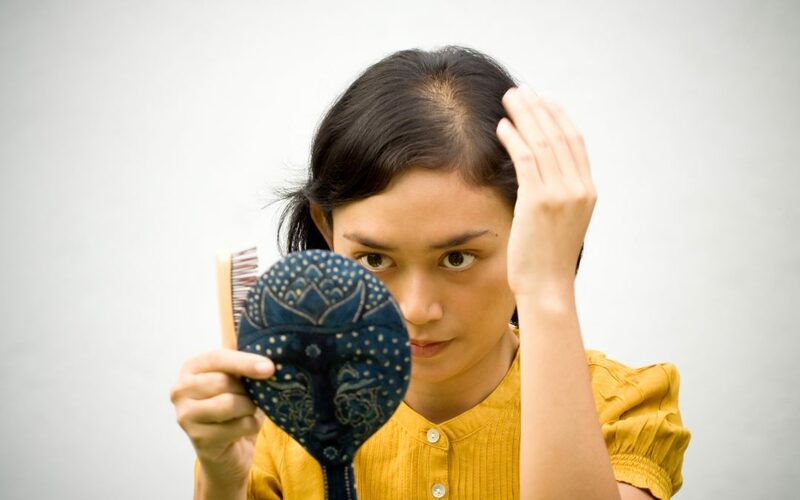 Unfortunately, many conventional hair loss prevention medications, treatments and diets are less than effective; some even cause uncomfortable side effects, while others might actually accelerate your hair thinning and loss. As with all drugs, prescription medications to treat hair loss are not without risk; many use hormones to alter your natural body chemistry, while other pharmaceuticals contain synthetic ingredients and chemicals that some health-conscience consumers would rather not be exposed to. If you are seeking an effective, hormone-free, non-pharmaceutical way to deal with your receding hairline or thinning hair, recent research has led to the development of a new line of all-natural hair restoration products using all-natural ingredients sourced from around the world. MD now offers a comprehensive line of premium quality, plant-based products that are designed to assist adults who want to achieve a fresh, rejuvenated scalp and fuller, younger-looking hair. These revitalizing shampoos, conditioners and supplements are specifically designed to address age-related hair thinning and loss; unlike other products that just mask the problem, MD Nutri Hair Restoration treatments are truly an anti-aging solution to this common issue. To learn more about how you can prevent unwanted hair loss and enjoy fuller, more youthful and healthier-looking hair, explore the MD Nutri Hair line of hormone-free, drug-free hair restoration products.